In need of something different to do with your bangs but don’t want to grow them out just yet? We have the answers if you are tired of your bangs just sitting there! You can either camouflage them or make them the focal point-but they definitely will not be “tired”. No matter what the hairstyle is, you can make your bangs work to enhance it or if you prefer-you can hide them within the style. If you want them to be the focal point as in the first photo, above left-a little texturizing putty or pomade can go a long way. Just work it into your bangs and put them where you want them so they are not just straight across if that is what you are trying to get away from for this particular style. If you want to have them blend in with your style, such as in Kelly Osbourne’s style in second photo above left, it is as easy as a bit of gel or mousse as you are are drying your hair. Pull bang up and over, to desired side very sharply and hold till dry then flip ends under with a curling iron and blend into rest of style, spray well with hairspray. What to do with your bangs for a Retro up do or Short hair style? Try forming a wave with them as Carey Mulligan, above center, did. Using a little gel or setting lotion form a loose finger wave in the direction, you want the wave to go. A long bang such as the one on Taylor Swift in fourth photo from left above can be incorporated into an up do by flipping them over themselves and pinning under one side of front of hair. This forms a loose loop and adds interest to your design. You can also do a side swept bang for a soft look, by curling bang in same direction as rest of style. Comb into rest of style and spray with hairspray. Sideswept bangs, brow-skimming heavy bangs and even short bangs. Beautiful long straight hair with blunt fringes. 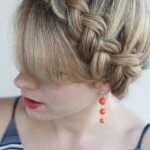 This is a great easy daily hair style for female. Full blunt bangs worn straight with wavy hair is a modern and on trend look. These bangs are piece-y and bring attention to the eyes. A cute long wavy curly hair style for girls. Long layers reveal just enough forehead and concentrate attention on your eyes and cheekbones. The gorgeous look is easy to style too. Overstyling with a brush and blowdrying can damage hair so style wispy bangs with fingers or just let them air dry. Different styles of bangs are worn with different parts. Side swept bangs go with side parts. Chin length and wispy bangs gently cover the forehead, highlighting the angle of the jaw and cheekbones. A lot Asian girls love the bangs very much. 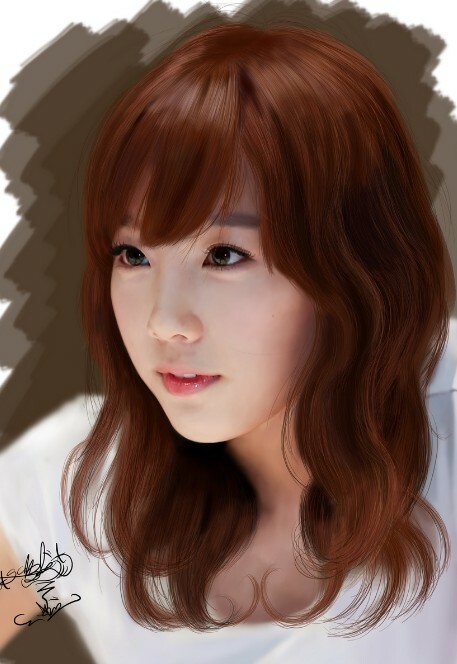 Here is a cute Asian girl wears beautiful long red hair style with wispy bangs. Here’s another flattering hairstyle with bangs. Straight across bangs cut just below the eyebrows focus attention on the jaws. Full fringe is traditionally worn with a center part. 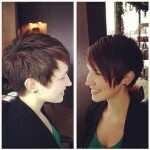 Here is a great layered short black haircut with full side swept bangs. A lot girls love this short cut, how about you? OK, here is another short red hair style with layered bang. So cool!